In 2008, first-time director Na Hong-jin released his film The Chaser. 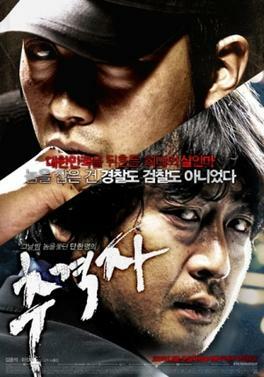 The film was inspired by a real life serial killer named Yoo Young-chul and Yoo Young-chul was apparently one bad dude. In this movie we have an ex-detective turned pimp named Eom Joong-ho (Kim Yoon-seok) who has recently entered financial trouble because two of his girls have gone missing. Eom grows suspicious that someone may be reselling his girls and that it might be the customer he had just sent Mi-jin, one of his remaining girls, to please. Unfortunately for Mi-jin, reselling women isn't exactly what Je Yeong-min (Ha Jung-woo) has in mind. Je Yeong-min is a killer and he likes to use a hammer and chisel and before long he uses them on Mi-jin. Once Je Yeong-min is finished with his business he leaves the house in order to ditch the call girl's car. He doesn't get too far when he is involved in a traffic accident with the very guy who just happen to be (unknowingly) looking for him... Eom Joong-ho! From there the chase really begins and Eom Joong-ho slowly starts to realize that maybe Je Yeong-min is more than a man that just resells women as he initially thought. He begins to fear even more for the life of Mi-jin. This movie is a wicked game of cat and mouse and I thought the ending took some stones to pull off. It's not the ending I wanted, but it is definitely one I respected. For a directorial debut, this film is top-notch. Hell, I didn't even know it was a debut until I looked it up after I finished watching it. Perhaps the thing I love the most about this movie is that Kim Yoon-seok doesn't give us a straight-up good guy. He's a dirty guy and he's a gray guy. If not for the fact that the cops were seemingly looking out only for themselves after an embarrassing political incident and that the other guy in this movie was a vicious psychopath, Eom Joong-ho might be a little tougher to root for. As it is, he's the only thing that stands between Je Yeong-min killing more women. Mi-jin might not be dead after all. The killer hints that she might be alive. If so, can Eom Joong-ho find her in time? I highly recommend this South Korean thriller. Sounds good. Is this a streaming flick? Yeah, I think it's called simply Chaser on Netflix, though. Combine it with I Saw the Devil and you have a killer double feature.